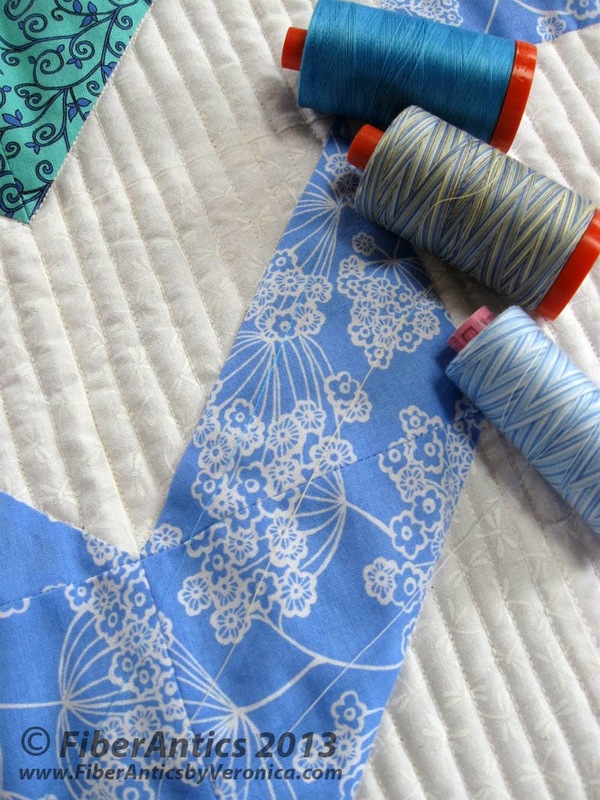 When Blank Quilting's Lola collection came out this summer, it had several coordinates that filled out the fabric line. One of the colorways is comprised of a cool analogous color scheme of turquoise, teal, aqua, green and royal that reminded me of what you might find in ocean-front beach houses. 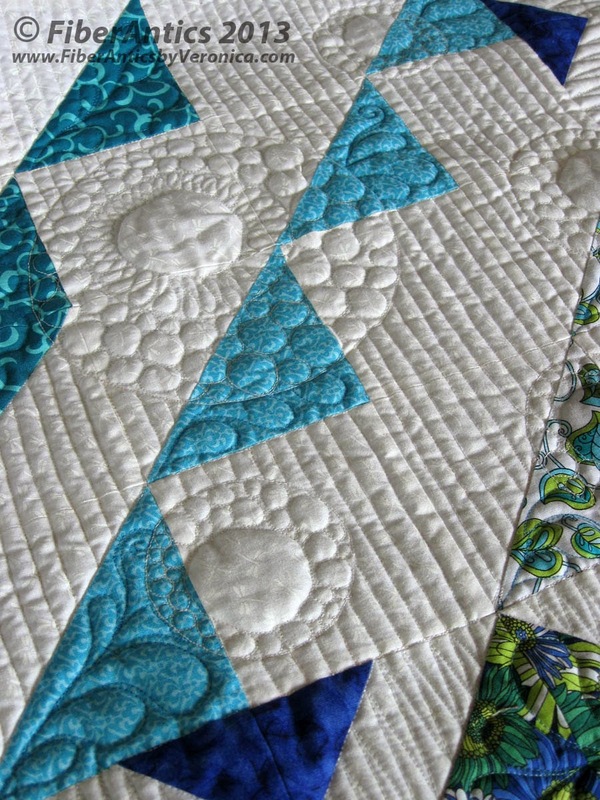 A modern quilt featuring Lola collection by Blank Quilting. Azteca pattern in Lola fabrics. Serendipitously, the Spring 2013 issue of Modern Quilts Unlimited was on the top of my pile of quilting magazines. This issue had Patty Sloniger's Azteca quilt pattern in it that called for a collection of 7 coordinating prints and a bright white background. The color palette looked very similar to that of Lola's blue/green colorway, so I paired it with a white, tone-on-tone, dragonfly print (6615) from Blank Quilting's White Out for the background to make my version of Azteca. For my quilt, however, I added a top and bottom border (the original pattern in the magazine had only side borders). 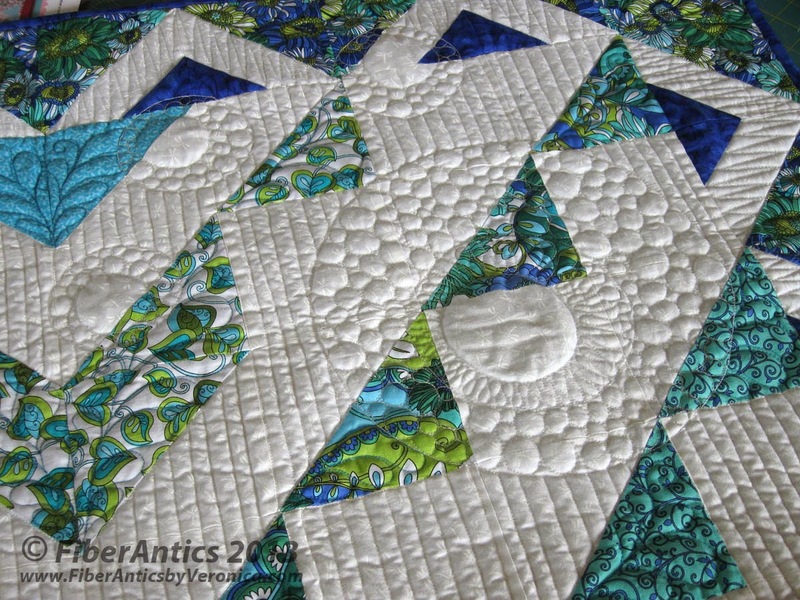 I think having borders on all sides keeps the eye moving around the perimeter of the quilt and it also created an interesting corner treatment. And now to my favorite part—the quilting. I kept it "modern" with free-motion straight lines in the white background areas. This was done with the feed dogs down (not with the walking foot—as it would have taken for. ev. er to quilt it that way). 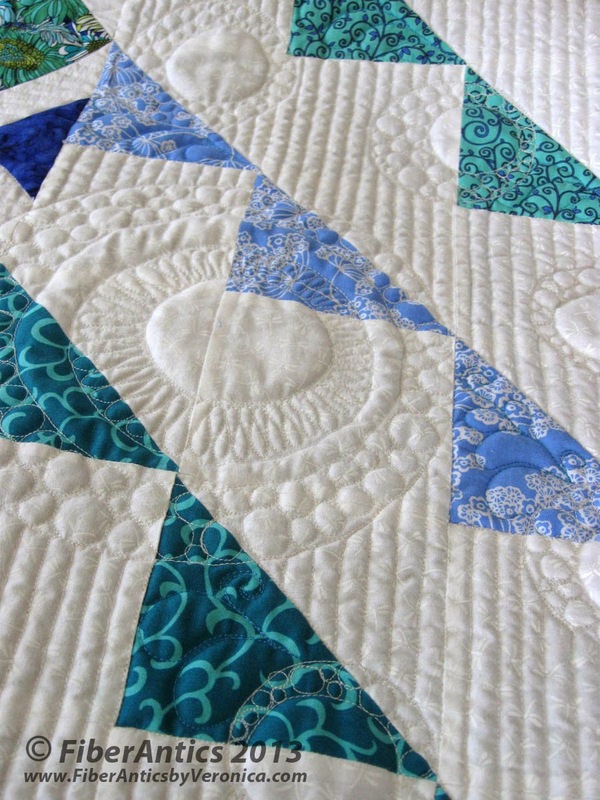 Three clusters of circles—several smaller satellites orbiting the larger one—strategically float over the quilt top. the straight lines in the background. 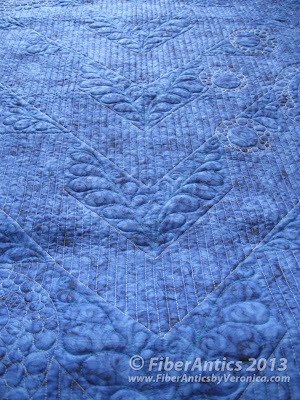 The triangles that create the chevron in the center of the quilt have a small feather motif quilted in each of them. The thread color for the feathers was a medium blue. The 108" backing fabric is Fusion Illusion (color: navy) by Blank Quilting. In reality, the color is more like royal than navy. Fusion Illusion 108" navy wide backing. 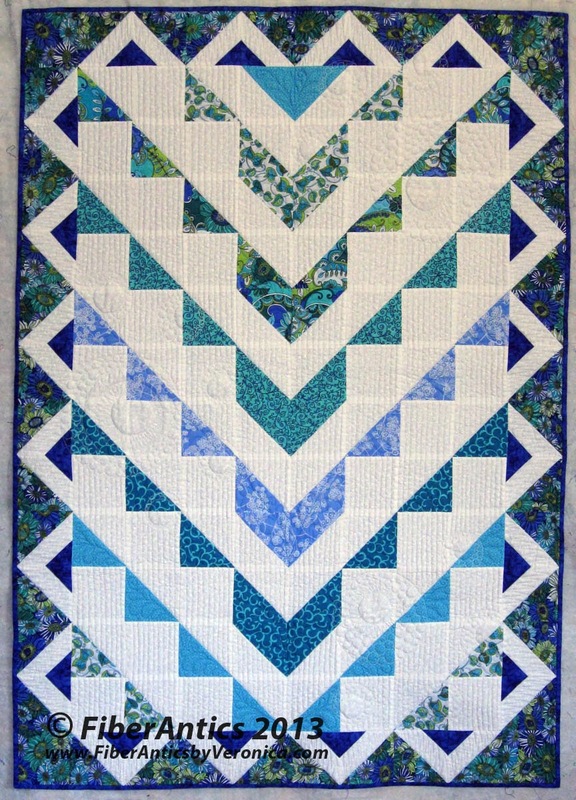 A free-motion zig-zag is featured on the border with a feather motif quilted in the border triangles. 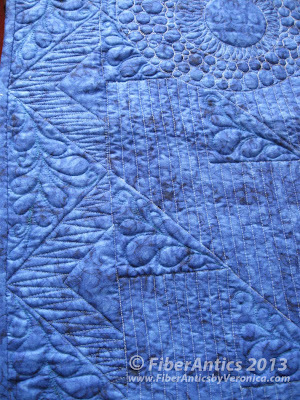 Back detail of quilting Lola. Finished size: 39.5" x 56.25"
Top threads: Auriful and WonderFil 50 wt. cotton thread. Bobbin: 60 wt. poly Bottom Line. 18.75 hours of quilting. 3 bobbins. Check your local quilt shop for fabrics from the Lola collection. (The other colorway is black/brown/gray.) 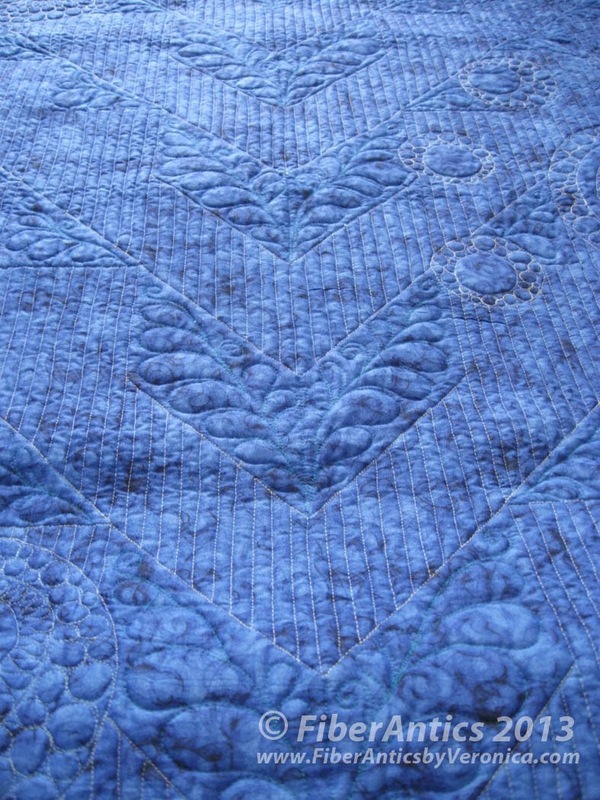 They are suitable for quilts with modern or contemporary styles, and would also work well with traditional block patterns, appliqué quilts or garments. Lola is very versatile!